After a beautiful day winetasting at Malibu Wines, I went to Santa Monica for happy hour at Sushi Roku. Located on Ocean Ave. with views of the ocean, and just a couple steps away from Third Street Promenade, Sushi Roku is a popular sushi restaurant with a good happy hour. I heard about Sushi Roku Happy Hour from being featured on a news special on TV. Supposedly one of the best happy hours in Los Angeles, so I wanted to try it out. I love happy hour- it’s perfect for an after work early dinner when you don’t want to eat so late, and of course everything is half off which makes it even better! I went to the Sushi Roku in Santa Monica (they also have one in West Hollywood and other locations). The Happy Hour is from 5pm-6:30pm Monday-Friday & 4:30pm-6:30pm on Sundays. Roku’s Fusion Martini- $5. Skyy Vodka, Honeydew Cantaloupe, & Watermelon with Pineapple & Cranberry Juice combined. So sweet and delicious! It tasted like a watermelon Jolly Rancher! lol. Our bartender was super sweet and promised it would hit us and that there was plenty of alcohol in it. She was right! These were dangerous… Lol. ~Our bartender Camille, made us her own specialty drink she created herself. It was one of the best drinks I ever had! It was made perfectly. Not sure the exact ingredients, but I know it was made with tequila, Agave Nectar, crushed muddled berries, Sprite, and some kind of juice. It was so smooth couldn’t even taste the tequila but it definitely got me tipsy! So delicious. Thanks Camille! ***Note: Not everything we ordered was from the Happy Hour menu. Some things were from the regular menu. The items NOT on Happy Hour menu I noted in parenthesis. ~”Hanabi” Spicy Tuna on Crispy Ricecakes- $4. I always order this when I go for sushi. My favorite! ~Seabass “Harumaki” Springroll with Herb Citrus Dip. $5. Good, but wouldn’t order again. The fried shell takes away from the seabass. ~Spicy Tuna Roll- $5. Traditional spicy tuna roll. ~Crunchy Spicy Tuna with Avocado & Spicy Mayo- $12. Loved this. My favorite type of roll. (Not on Happy Hour menu). ~”Roku style” Albacore Tacos- $6. These were so good! My favorite item on Happy Hour. Best thing we ordered of the night. We had to order another one of this. Fresh albacore with avocado and ponzu sauce with fresh lemon in a crispy wonton taco shell. ~Yellowtail Sashimi- $4. YUM! Fresh fish sashimi is the best. 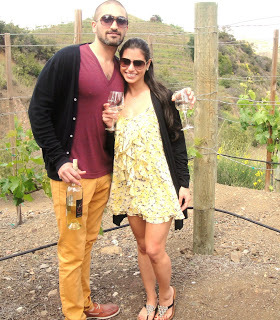 In addition, Malibu Wines is an amazing place to go for winetasting. It’s in the mountains in Malibu with picnic areas and bands that play live music. Everyone brings big picnic baskets- fresh baguettes, crackers and cheese, fruit, etc. You can’t bring your own alcohol, but it’s only $20 for a bottle of wine and they give you complimentary wine glasses to take home with you. Tasting fees are cheap too. There are a bunch of tables and chairs, and big grass area where you can park yourself on a blanket and have a nice picnic. When I went, there was a Spanish guitar music band playing- they sounded like the Gypsy Kings! It was very romantic and beautiful. Highly recommend this place, but don’t forget to bring your own food!